BANGKOK, Jan 25 (Thomson Reuters Foundation) - More than 100 Sri Lankan Tamil families demanding the return of their land nearly 10 years after the end of a civil war, plan to occupy their former homes on Saturday if the government does not hand over the properties as agreed. Residents of Keppapulavu village in northern Mullaitivu have campaigned for nearly two years for the return of their land, in what activists said is the country's longest roadside protest. 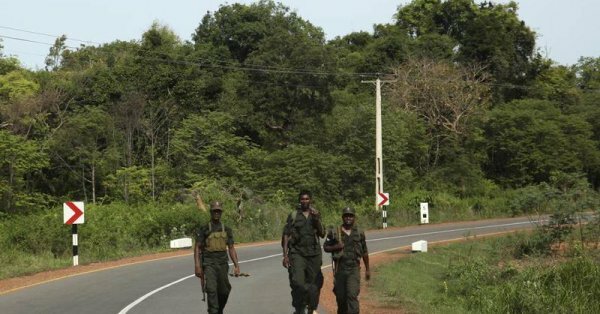 About 30,000 acres of land is still held by security forces in Mullaitivu, which saw some of the heaviest fighting during nearly three decades of civil war, according to advocacy group Adayaalam Centre for Policy Research (ACPR) in Jaffna. "These people have waited for so long to get their land and homes back, and resume their lives," said Kumaravadivel Guruparan, ACPR's executive director. "They feel they have no other option but to occupy their homes," he told the Thomson Reuters Foundation by phone on Friday. Sri Lankan President Maithripala Sirisena said in October that all land held by the state in the northern and eastern provinces would be returned by Dec. 31. When that deadline passed, Keppapulavu residents were promised by authorities that their land would be released by Jan. 25, said Guruparan. The villagers will occupy their properties on Jan. 26 if the deadline was not met, he added. "We have returned all the land that we could return. We have retained some land for national security purposes," said Brigadier Sumith Atapattu, a spokesman for the Sri Lankan army. "Most villagers had agreed to sell that land to us. We need to negotiate again to arrive at a solution," he said. Thousands of people were killed and tens of thousands uprooted from their homes in the war, which ended in 2009. Most victims were Tamils, an ethnic and religious Hindu minority. Tens of thousands of acres of land taken during the war is still held by government forces who set up security posts and buffer zones, Human Rights Watch (HRW) said in a report published late last year. More than 10,000 people remain in camps, and many others are still "effectively displaced", HRW said. Government authorities said they had returned about 80 percent of all confiscated land. In deciding to occupy their homes, the villagers of Keppapulavu were following the lead of more than 350 Sri Lankan Tamils who last year reclaimed their homes on an island held by the Navy, Guruparan said. "For the people of Keppapulavu, justice, peace and reconciliation remain empty words until they are able to return to their houses, lands, their way of life," said Ruki Fernando, an adviser at INFORM, a human rights centre in Colombo. "They survived the war, only to suffer for their land."